Last week Pulitzer Prize-winning cartoonist Ann Telnaes and The Washington Post came under fire for publishing a cartoon depicting Republican presidential contender Ted Cruz in a Santa costume with his two daughters shown as dancing monkeys tethered to a crank music box labeled “Cruz 2016.” Although a majority of the backlash has come from fellow Republican Party members and supporters, Telnaes herself has received support from free speech activists and organizations defending her right to freedom of expression. 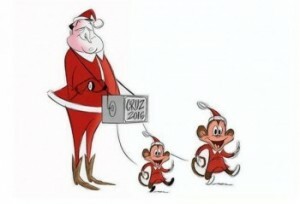 Telnaes drew the cartoon in response to Cruz’s decision to include his two grade-school age daughters in a Christmas-themed television ad that attacked Cruz’s political opponents. Published on the Post’s website for only a couple of hours, the cartoon was promptly taken down after Cruz as well as other Republican politicians, including Marco Rubio and Donald Trump, took to Twitter criticizing the newspaper’s editorial decision to depict Cruz’s two daughters. They argued that the cartoon unfairly and arbitrarily attacked Cruz’s family. The party that was wrong in all of this was the Washington Post, which spent only minutes determining that they should throw Ann under the bus by apologizing and taking the animation off of their website. Ann pushed the envelope for free speech just a little bit farther. Too bad the editors of the Washington Post didn’t have the sense or presence of mind to understand what was going on. Of course, they are still getting settled in with their new owner. Taken in full context, Cruz was clearly the target, but he and his supporters deflected the message by claiming his children were the victims. This is a technique many employ when in the crosshairs of satire, and the media must be careful not to fall for this argument hook, line, and sinker. While the editors at The Washington Post are free to edit how they see fit, in our view it would have been best to defend the cartoon once it had been published. Retracting it risks the appearance of caving to political pressure. While it would be in bad taste to arbitrarily go after a public figure’s family, it is fair journalism to criticize the senator for using his own children to attack a political opponent. And that’s precisely what Ann’s cartoon has done. It does not stray from the time-honored tradition of cartoonists using satire to speak truth to power and protect the powerless — in this case, children.